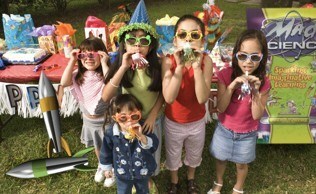 Do you want to give your child the best birthday experience ever? Schedule a Mad Science Party TODAY! Your child and guests will love the fun, high-energy and interactive show put on by our very own Mad Scientists. The best part is, we come to you! Whether you want your party indoors or outdoors, we can make it happen! 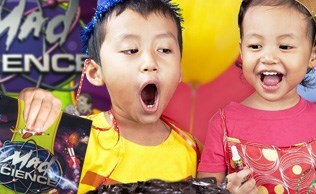 Just choose the party package that best fits your needs and leave the entertainment to us. Don't forget, every child leaves with a fun hands-on item that they make themselves. Choose between Slippery Slime, Mad Science Putty, Styro-Slime or a Superball. Pick your child's favorite for endless fun! Check out what parents are saying about Mad Science Parties or share your thoughts on your latest Mad Science Party! Amazing show! Completely exceeding my expectations. We will use your service again. Radical Rob is an absolute professional! Erika/Teanna, Thank you so very much for providing am AWESOME MAD SCIENTIST and a PERFECT experience for my daughter's birthday party! Keeping 10+ 5th grade girls is NOT an easy task, but you guys made it a breeze. Total interaction and all the girls loved the take home gifts. ALL IN ALL - A GREAT EXPERIENCE and a HUGE value for everyone!!! !